Baby don’t you want to go? Regions of the U.S. like to lay claim to their own pizza: has its own concept of what pizza is supposed to be: The thin, foldable New York kind, the grilled, veggie topped California kind, and my favorite, the deep dish Chicago kind. After a weekend in Chicago where I somehow did not consume any pizza (blasphemy! ), it was time to conquer it myself. I did a lot of research before taking on this project. 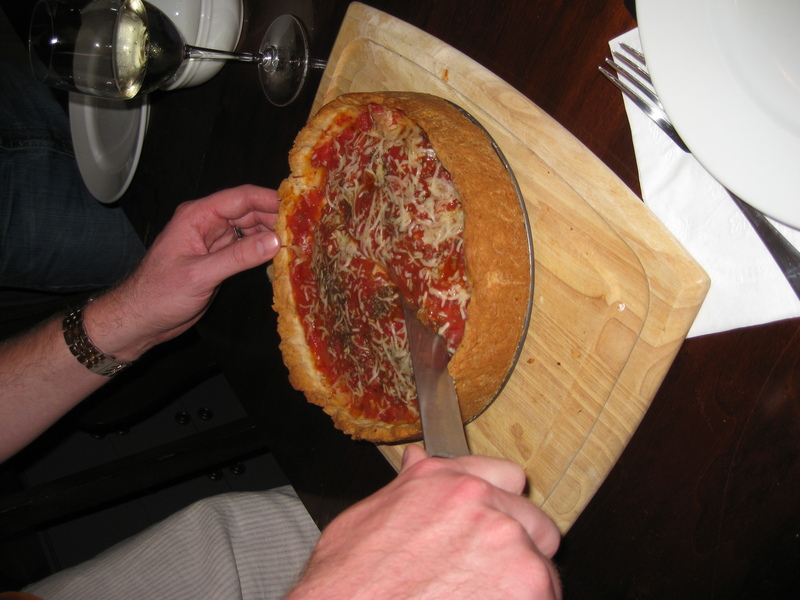 I discovered there is more than one kind of Chicago style pizza. Exhibit A: this restaurant is famous for its Chicago style pizza. It has a crust on the bottom AND a crust on the top, along with the cheese-on-the-bottom-sauce-on-top layering that IS Chicago pizza. Exhibit B: This equally famous pizzeria however, does the crust on the bottom, sauce not cheese on top strategy, but with ONE layer of crust. I’m pretty sure I’m the first one to realize this. Ok, not really, but its a distinction that’s never mentioned in recipes. Huh. Anyway, I watched a couple videos, read a bunch of recipes, even watched an episode of Bobby Flay’s “Throwdown” about Chicago pizza. Then…it was go time. I made my pizza dough as I would for a regular thin crust pizza, but substituted olive oil for some of the water. 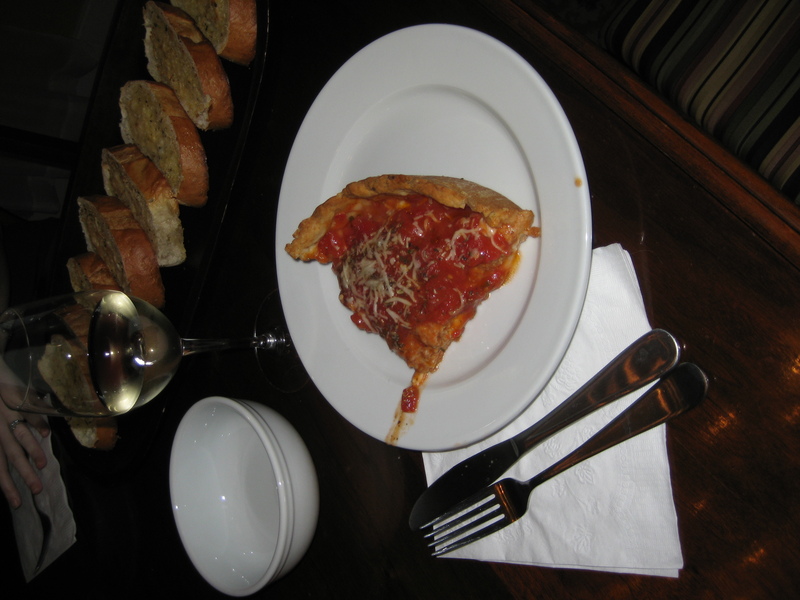 Chicago crust is flaky and buttery not thin and crispy. 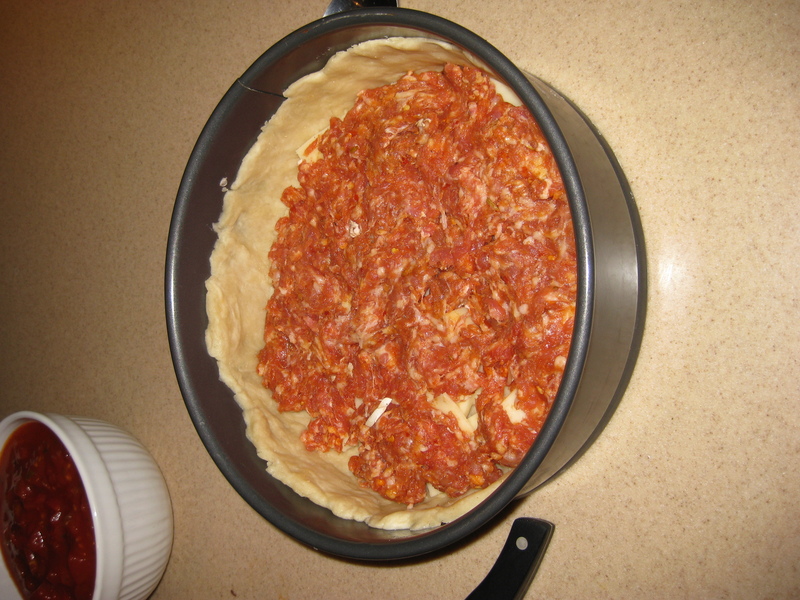 TIP: I got a hint that a spring form (cheesecake) pan works really well for deep dish pizza. 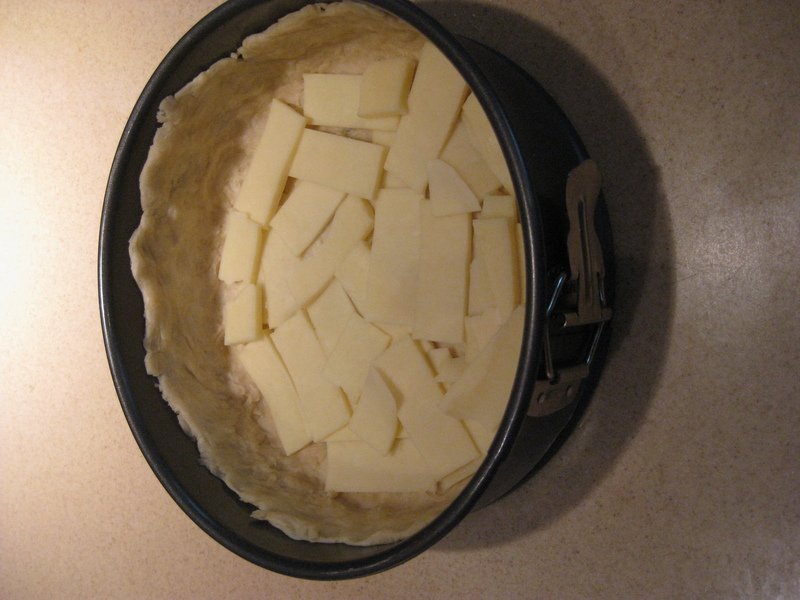 Crust followed by cheese. Yes! Cheese on the bottom. Also, I have to admit: I broke another rule. I used cornmeal in the pan. Apparently this is Chicago-style heresy (like cheering for the Packers) so don’t tell anyone. But I fear sticking to the pan more than I fear wearing Crocs. So I went for it. FIRST- the cheese. “What,” you say, “Cheese goes last!” Nothing doing my hungry friends. Mozzarella on the bottom. And not that shredded stuff either. Sliced mozzarella. And lots of it. Nothing says "Chicago" like pork sausage! Next comes the meat. A patty of meat. (Wow that phrase is unappetizing) You press the uncooked pork sausage on top of the cheese, making a full layer over the pizza. Yes, uncoooked. We’re going to bake this baby plenty long…it’ll cook in the oven. Now the final layer: the sauce. Chicago style pizza comes with chunky sauce. And Mark Malnatti (from a family that knows a thing or two about pizza) uses uncooked sauce since it will be cooked in the oven. Somehow, I never thought about this. So, I used diced tomatoes with Italian seasoning mixed with tomato paste to make my own thick sauce. Spread it over the meat patty (sorry) and sprinkle on some Parmesan and some Italian seasoning. Pop it in a 400° oven for about 30 minutes. Let cool for a FULL five minutes before cutting. The results? Fantastic. In fact, one of our dinner guests, a former city-of-big-shoulders resident went so far as to state “I would order this pizza in Chicago.” And hell, it could win a pizza pageant with those good looks. We devoured it all, forks and knives flashing. Don’t embarrass yourself by trying to pick it up. And I can pretty much guarantee you that my Chicago-born parents are going to be demanding this pizza after reading this blog post. Except they’ll pronounce it as my “blaaahhh-g post”, since, well, they’re from Chicago.